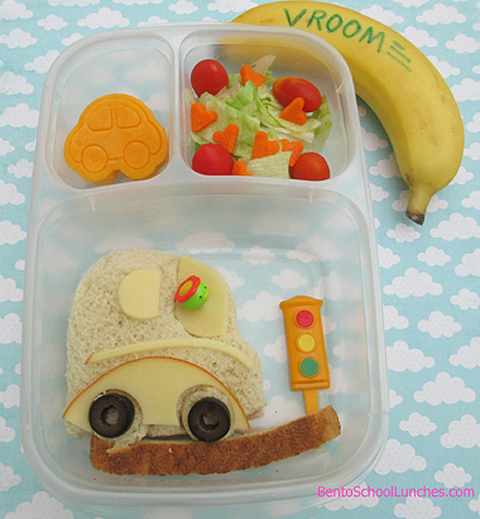 Bento School Lunches : Bento Lunch: Car bento...Vroom! Last Sunday we were glad to see Kimi Raikkonen win the Formula 1 race in Abu Dhabi. He is one of our favorite race car drivers and we are big fans of Formula 1. Car shaped sandwich with smoke gouda cheese accent, olive wheels, bread crust road and couple of food picks. Cheddar cheese slices, cut and stamp with a car cutter. Salad of lettuce, grape tomatoes, mini heart shaped carrots and a banana with food safe marker lettering. Packed in an EasyLunchboxes container. Thanks so much Ming! :-) The cutter and stamper set is quite useful. Such a cute bento, my son would love this! This is so cute!! I love that you used the crust for the road!